My best friend recently went to Japan on holiday. I think the first thing I said to her when she told me she was going was "you MUST visit the craft shops"! 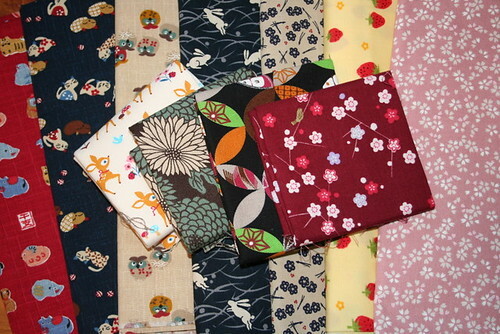 She's not particularly crafty herself, but she sort-of understands my fabric obsession, so she posted back for my birthday a parcel from Nomura Tailor containing half yards and fat eights of some great Japanese craft fabric, plus a couple of patterns for children's clothing. She obviously knows me very well, because I love all the fabrics! In fact I have been coveting the owl and rabbit prints (in the middle of the photo) in some online stores. All the prints also coordinate well with my existing stash. I'm looking forward to using these in some baby shoes and bags. lucky! I really like that brown and blue floral one next to the deers. I'm a bit funny about 'new' fabrics but I can definitely see the cuteness in those owls too. Oh goodie that! What a swell gift.